If you want to lose weight jumping rope, this article will show you a 21-day jump rope challenge to help you reach your weight goal. Besides ‘how to lose belly fat’, the most common question I get is ‘how to stay consistent with exercise’. Taking up this jump rope challenge can help you become consistent and make exercising a habit. According to the late Maxwell Maltz, it takes 21 days to form a habit. So completing this challenge may be just what you need to make exercise a lifetime habit. By the time you complete the challenge, you’ll be a skilled rope jumper and a few pounds lighter. And don’t worry about overtraining. Jumping rope is not a strenuous exercise so you can do it every day. All you need for this challenge is a jump rope and a timer. Note that this challenge can last longer than 21 days if you’re a beginner. I have divided it into 3 levels – beginner, intermediate and advanced. A beginner should do the beginner jump rope variations for 21 days, then advance to intermediate level for the next 21 days, and then complete the advanced level for another 21 days. Feel free to rest for a few days between levels. In the jump rope guide, I talked about the benefits of jumping rope, different jump rope routines, the basics of jumping rope, how to improve jump rope skills, and much more. Read this article first if you’re new to jumping rope. Use a speed jump rope – most people recommend this one. Adjust rope length – The handles of the jump rope should reach your armpits when you step on the middle of the rope – shorten the length as you become skilled. What makes this jump rope challenge different? Frankly, there are many jump rope challenges on the web but most of them are full of flaws. Here’s what you’ll get from this challenge that others don’t have. #1. Progression – Most jump rope challenges out there lack progression. They advise you to jump rope for 5 minutes for the next 30 days. You’ll get minimal results from such a challenge and it’s boring! The 21-day jump rope challenge requires you to gradually increase workout duration. #2. Variations – Doing different variations will make the challenge interesting and you’ll learn different skills. Unlike most challenges, this one requires you to do a different jump rope variation after every 7 days. #3. Customization – Most jump rope challenges are not designed for people of different fitness levels. This challenge is designed to fit everyone, from beginner to advanced. #4 Short enough to follow through – All workout challenges last for 30 days. Now, exercising for 30 days straight isn’t possible for most, especially folks who don’t exercise frequently. But 21 days is doable. Do a different jump rope variation after every 7 days in the order I have arranged them below. Start here if you’ve never jumped rope before or if you want to sharpen your jump rope skills. This is the most basic jump rope movement. To perform it, keep your feet together and hop after every swing. You have to learn this variation if you want to master other jump rope variations. Jump on one foot then alternate legs after every swing. This variation is less challenging and you can do it for long. This somehow similar to the alternating jumps but it’s more challenging. When alternating legs, lift the dormant foot as high as possible and repeat the same for the other leg. Once you’ve completed 21 days of the beginner level, move up to these variations. Or if the beginner level isn’t challenging for you, start here. Jump rope on one foot continuously then switch legs and jump on the other foot for the same period of time. Avoid jumping on one foot for long because it puts a lot of pressure on the knees. I may note that this is the best jump rope variation for building the stubborn calf muscles. This is similar to the basic two feet hop. But instead of jumping on the spot, jump front after one swing then jump backward after the next swing and repeat. This variation is quite challenging and will test both your core strength and endurance. You’ll basically run on the spot and jump rope at the same time. This may sound challenging but it’s not, once you’ve learned the basic jump rope movements. Jumping the rope backward will improve your coordination and make you a better jumper. Just swing the rope backward while doing different jump variations. This is a challenging variation but it’s very effective. Make a bigger hop and swing the rope twice before you land on the floor. Make sure you don’t mess up your form. Keep the body upright, hop higher and swing the rope faster. Jumping rope is one of the best ways to stay in shape. This challenge can transform your body if you complete it. So get a jump rope and keep jumping for the next 21 days. 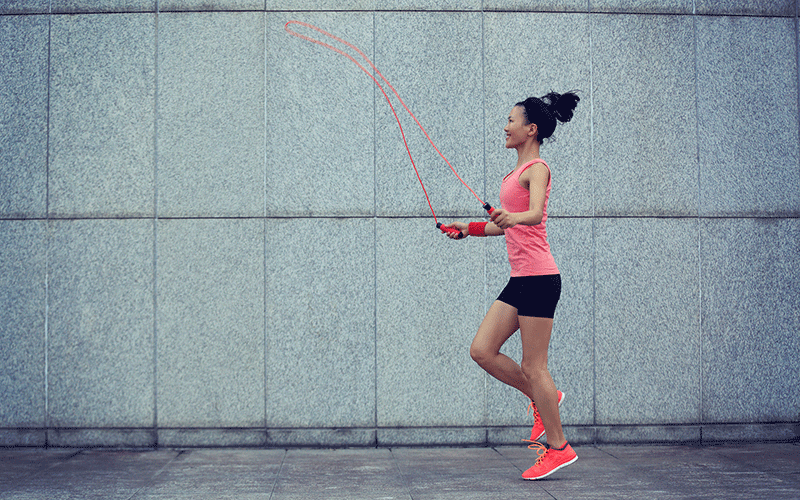 Are you ready to take on the 21-day jump rope challenge for weight loss? Thanks for the correction, Mike!